I can’t be a light unless I turn my face to You. I’ve been listening to a song today called ‘You are the Sun’ by Sara Groves. It’s got some beautiful imagery in it, that has been inspiring me to pray that God would keep on changing me and moving me towards Him. Because this isn’t a new revelation, or even a really profound one, but it’s just the true realisation of my heart. I’ll never be a light unless I turn my face to You. I believe that we were created to shine, to be lights in the world, in the image of Jesus who is the Light of the world, and who calls us to radiate Him. But so often, I know that He has created me to shine, but I really feel like I’m reduced to more of a glimmer. Or a fading glow. Or sometimes just the faintest of embers. Because I allow situations to rob me of my light. Or I allow shame to cause me to hide my light. Or I let condemnation tell me that I’m not worthy of shining at all. And only He can cause me to shine. Shine on me with Your light, without You I’m a cold, dark storm. Ok, so as I was reflecting on these things, the passage that came to my mind was Exodus 3. Yep. That’s the burning bush passage. Hear me out… I’m going to paraphrase. The story begins with Moses in the wilderness. He’s been in the wilderness for 40 years. And he ran away to the wilderness because of his own wrongdoing. 40. Years. 40 of them. Now, honestly, I complain to God if I feel like I’m in a wilderness season for 40 minutes, or 40 days… But 40 years? That’s some character building refinement. That’s a really, really, really long time. And we are told that as Moses served in the wilderness, he came to the mountain of God. Which I think is a deliberate revelation in this story. Moses was in the wilderness. But He was still seeking Yahweh. And the mountain of God is in the wilderness. There’s something that God does in us in these seasons of desert-place that prepare us to approach the Presence of God rightly. That our brokeness produces the fruit He can use to speak to us. That Moses, the humbled-and-rejected-desert-dwelling-shepherd, was somehow more ready to lead the people of Israel from that place, than the foolhardy young man who had taken a life in anger 4 decades previously. Yahweh knows best how to bring His glory out of our lives. So the Lord appears to Moses in a way that catches his attention. In His light. In a bush, that appeared to flaming with fire, but that didn’t burn up. Now, Moses had been in the desert a long time… A really long time. He’d have seen plenty of bushes and probably plenty of bush fires. But a fire that didn’t consume and didn’t go out? A light that didn’t fade? Moses recognised the Lord. He was compelled to respond. Because the distractions fade in the wilderness. So that we can see Him clearly. And it was when he responded to this light of God, to this very fire of the Presence of God, when he moved towards Yahweh, that God spoke to him. Yahweh called him. There’s so much in this passage, but I just want to stay here. At our response to the light of God. Because God doesn’t lead us into the wilderness just for the sake of it. He leads us into the wilderness so that we can be positioned to see His light shining in a different way. In a real way. We might have walked past the mountain of God crying out for Him every day for decades. We might have passed 100 bushes on fire before we see the one that is burning but that doesn’t go out. We might be questioning the cost of the desert, and the purpose of the pain. But, here’s the thing… The wilderness makes us sensitive to see. To see His light. To turn our faces towards Him, so that we can be a light. That radiates Him. Because we can’t be a light, unless we turn our faces to Him. Until we change. Until we position ourselves before Him without distraction, and without compromise. Because then we can see. And then we can hear. And then we can know. We were created to shine. 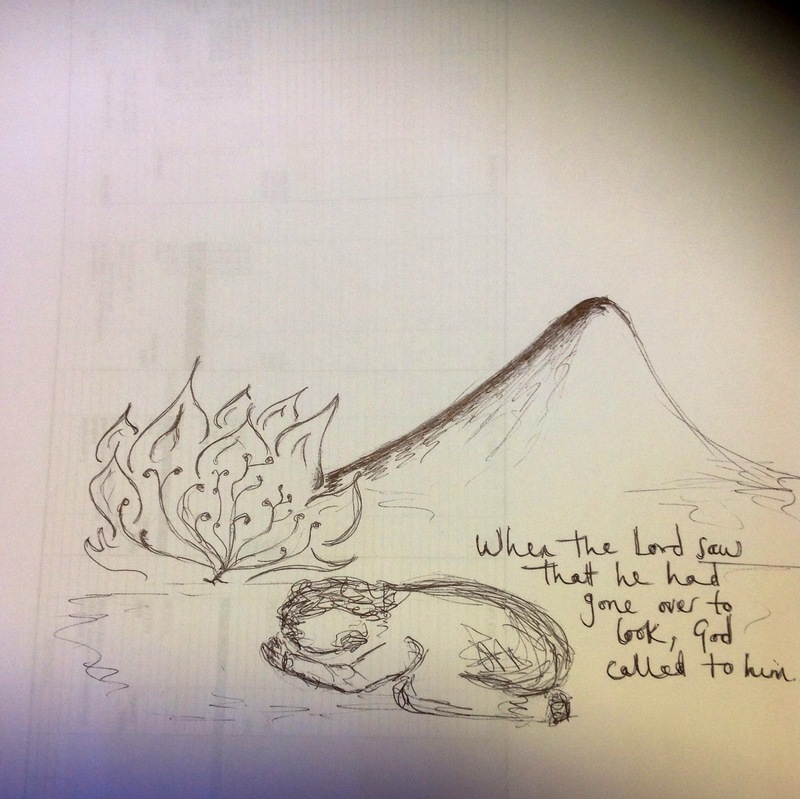 And as often happens when I’m meditating on a Bible story… Here are my day’s doodlings… Yes. That is a drawing on the back of a budget spreadsheet. Yes. I am now going back to the figures on the other side. Haha. ← Lust is the great enemy of love.